Rocco Rossi’s speech to the Empire Club yesterday [PDF] has generated a lot of discussion, especially his pledge to end “the war on the car” by opposing bike lanes on arterial roads and halting planned transit construction. Underscoring that discussion is the news that another pedestrian was killed on our streets this morning, a tragedy that also brings pedestrian safety and infrastructure to mind. The second thing is what really stuck with me, though. She said, “I can’t imagine what this city would be like without our bike lanes. Everyone would have to drive. It would be so congested and impossible to get around.” The realization hit me like a tonne of bricks: she’s describing Toronto. As Hamutal Dotan wrote for Torontoist earlier today, “what we need—urgently, and very badly—is to measure the success of our roadways by how well they move people, not cars, and privilege the modes of transportation which are most efficient at moving the largest numbers of people.” Rossi was absolutely right when he said that “cars are simply a necessity for many people,” and planners need to recognize that. However, his contention that this city suffers from too much traffic congestion due to a “war on the car” is backwards: the fact that we have so many cars on the road causing congestion is a direct result of urban design that has disproportionately favoured cars over other methods of transportation. The idea that we can somehow accommodate more cars on downtown roads while improving traffic conditions is fantasy. The best way to improve driving conditions is to offer better alternatives to driving. All of our best research shows that when people have a transit system that works and treats them with dignity and a cycling infrastructure that doesn’t make them fear for their safety, they take advantage of it and drive less. That means fewer cars on the road, which means less congestion for those who choose or need to continue to drive. Drivers (a group that, as an Autoshare member, I include myself in, along with being a cyclist, pedestrian, and transit user) who want less congested streets should favour “complete streets” that do a better job of balancing different transportation options. Great post Chris, I couldn’t agree more. I drive everywhere, but I bought a bike so that I could bike around instead. The truth is that I’m too scared to bike in downtown Toronto. You’re too close to traffic and I don’t feel safe. I think if you bike everyday in Toronto, you have to take into account that at some point you will be in an accident either with a car, or caused by a car. 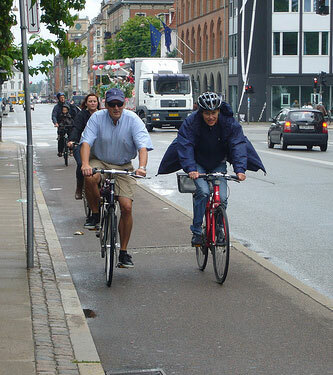 If there were more dedicated bike lanes, like in Europe, I would certainly drive less. I do hope you never win election. Our cost of Copenhagen was over $20 milion – what the waste. having spent a lot of time in copenhagen, the city planners were much more concientious of the needs of motorists and further, this is a very old city., not set up or designed with the grid we have or the suburban issues. i have no problem with bike lanes, but, not at the expense of car lanes on major arteries. make bike roads, dont destroy the accessibility and traffic flow of major auto roads such as st clair, bloor or avenue road or mount pleasant. what city planner are considering, for example with bloor and mt pleasant is nothing but a form of tyranny against drivers. the city is going to such a huge expense to take away from auto traffic the planners, elected officials and administrators would be better off spending the money on “all bike” designated roads! then there would be no more road sharing and road rage on the part of either bikers or drivers and far fewer accidents or near accidents. until bikers can be stopped and charged for misdeads on the roads as readily as drivers, bike sharing with either pedestrians or cars is ludicrous. I really like your vision for Toronto, Chris, but I can’t agree with you on the bike lane issue. I live on Jarvis and don’t own a car, but I was sorry to see the loss of all those metered parking spots in order to create under-used bike lanes. My out-of-town guests and friends from the suburbs no longer have anywhere close or affordable to park when they come to visit, not to mention the loss in parking revenue for the City of Toronto. I could understand if the bike lanes were actually busy, but I have only seen one cyclist using the bike lane on Jarvis – one – and he wasn’t even wearing a helmet. This “if we build it, they will come” mentality clearly isn’t working. Commuters aren’t opting to ride their bikes to work. For most people, it’s too far, the weather coniditions are too harsh and it’s unrealistic to expect them to commute in business attire or factor in the time to change/shower at work. For those who only have a short commute, we would be better to invest in the TTC as a transportation solution and promote cycling as a recreational/healthier lifestyle activity. I agree with C.C., the loss of parking spots on Jarvis has been a very steep price to pay for residents on the street. I live in a very old building, and now have no where to park to unload heavy items to bring into my home. Having furniture delivered, or anyone moving into or out of the building, now is almost impossible. There is no loading bay. The driveway doesn’t allow for passing cars, so parking in it to unload items requires moving of the vehicle if building residents need to come in and out with their cars to the very limited resident-owned parking spots in back of the building. I’m not opposed to the bike lanes on Jarvis, I prefer less traffic as it is quieter. HOWEVER, we need our parking back! We need parking included in the plan for this street, by way of cut outs of sidewalks if bike lanes remain on the street. This is a residential area, and the lack of parking is a real and constant problem for those of us that live on this street. I know parking is not a hot-button issue, but it is really important to those of us that live on this street!